At a recent World Economic Forum workshop on the topic of successful digital transformation, a group of executives passionately debated the challenges of managing their most important resource - human capital. The participants ranged from major global retailers employing a wide range of people (including store clerks and AI gurus) to Silicon Valley tech companies and a start-up about to open its new European headquarters. The war for talent is not new, but the workplace is changing. Employees today increasingly demand more than a paycheck. They want to believe that their work matters; they want to be part of a culture that fits their values; and they want to be engaged and inspired by their jobs. At the same time, companies have changing needs as well. They want to operate in a more nimble fashion with a more fluid, flexible workforce, and they need employees with contemporary skills. Talent strategy needs to balance the needs of both employees and employers. Successfully acquiring, developing and deploying talent starts with a strategy that dictates what work will be done in-house (rather than by partners), how it will get done (whether by people or technology) and by whom (whether full-time employees, contractors or partners). Next, companies need to create a compelling value proposition for talent that includes training in new skills as well as development opportunities - a New Deal for Talent. This new deal isn’t just about training and development, but also about rewards: financial, developmental, and rewards tied to mission and purpose. From there, firms can design modern talent management systems that smartly integrate digital tools to identify, recruit, engage, compensate, deploy and develop talent. The group had a robust discussion about what motivates modern employees and what type of “deal” is required to attract and retain them. To appeal to the best and brightest, do you need to offer nap rooms, free lunches, a foosball table and a corporate mission to save the world, or will a steady paycheck suffice? The answer likely varies significantly by sector, generation and skillset, but some themes are emerging. Today’s employees still value security, predictability and status, but the form those attributes take is changing. Security becomes less about lifelong employment and more about lifelong employability, achieved through constant acquisition of new and relevant skills. Employees are not giving up predictability, but their timelines are shortening and their willingness to experiment in different roles and functions is growing. They do still value status in the form of fair compensation, benefits and rewards for out-performance. But in today’s flatter organizations, that status often comes in the form of roles of increasing responsibility and impact, rather than a march through a hierarchy of job titles. These changes create a new set of challenges and opportunities for employers. A renewed emphasis on development will likely entail investments in training, apprenticeship and cross-functional rotations. Employers will benefit from creating strong, clear links between employees’ work and the purpose it serves. New systems reflecting these changes will need to be developed. Pay, for example, was historically keyed to factors such as revenue growth and profitability targets, based on what both an individual and team had accomplished. Now different metrics must capture an individual’s contribution to a cross-functional group, or, in some cases, to non-quantifiable goals that span the entire company. A big idea emerged from the conversation: increasingly, companies must understand that the needs of employees are not all the same. Employee ‘segments’ likely exist in the same way that customer segments do. In the customer realm, we have moved to mass personalization, down to the individual “segment of one". We anticipate customer needs, rather than simply react to them. Why can’t we apply the same logic to our employees? Can we identify unique needs among our employees and serve them differently, offering individualized learning plans, tailored recruiting messages and even personalized rewards? Can we apply the same types of data and tools we use with our customers to our internal talent? HR executives have already begun to move toward this nuanced approach. 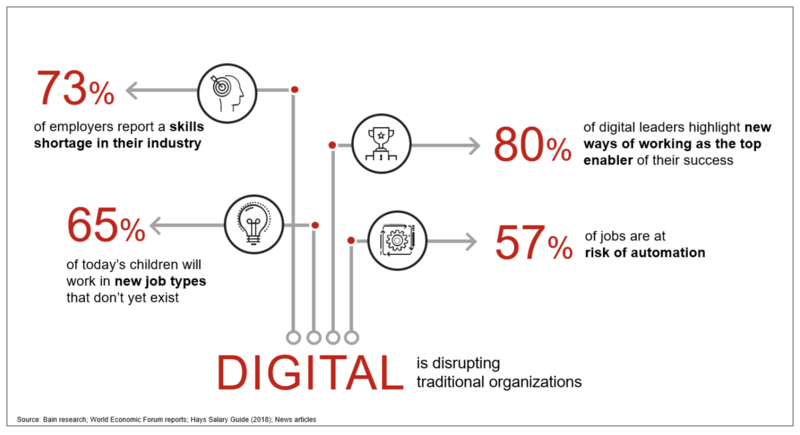 Recent research led by our Bain colleague Michael Heric found some using sophisticated digital tools to fine-tune their understanding of each employee and improve career management, career planning and performance measurement. In talent acquisition, digital technologies can personalize the experience of recruiters and candidates while expanding the talent pool, filtering for candidates with the right skills more efficiently and effectively, and helping identify future talent needs earlier. In workforce planning, technology helps identify ideal team compositions and enhance collaboration among team members. In performance management and motivation, it helps identify the metrics that truly matter for performance, and supports continuous feedback among employees, their peers and supervisors. In the realm of learning, it pinpoints training needs earlier, and improves reach, engagement and information retention through hands-on, accessible methods. Early results of applying data-driven insights to talent management are strong. Studies have found machine learning can be up to 17 times more accurate than other methods at predicting who will resign, for example. Natural language processing has helped recruiters at Johnson & Johnson, Atlassian, Twitter and other companies improve the quality of their job listings in order to enhance the inclusivity of their workplaces. Google’s dedicated People Analytics team is working on a wide range of challenges, from determining the best size and shape of a given department to reducing defections after maternity leave. The report, The Digital Enterpise: moving from experimentation to transformation, is available here.